A, C, E , 1, 2,3 ,7, N, Q, R, S Subway Trains to 42nd Street and Broadway . 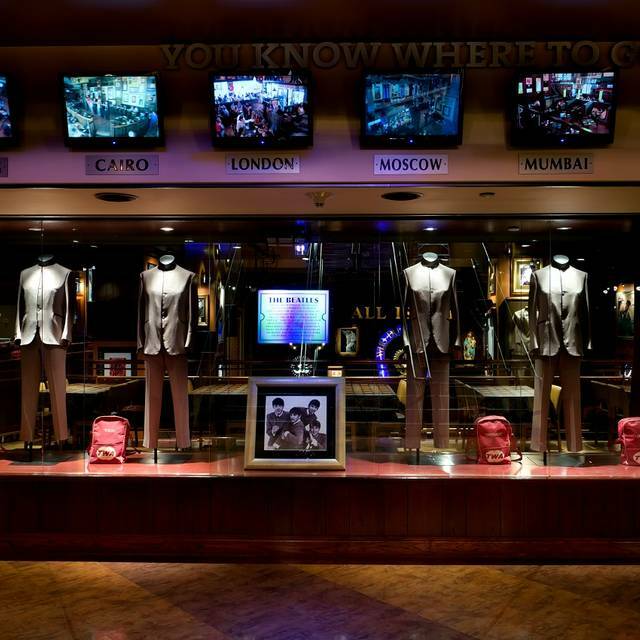 Located in the center of New York City and the heart of Times Square, Hard Rock Cafe New York will rock your senses with tantalizing food and drinks and an awe-inspiring collection of music memorabilia. Times Square, also called the “Crossroads of the World” is the home of the New Year’s Eve Ball Drop, Broadway Theatre, Madame Tussauds wax museum, and many other famous attractions. 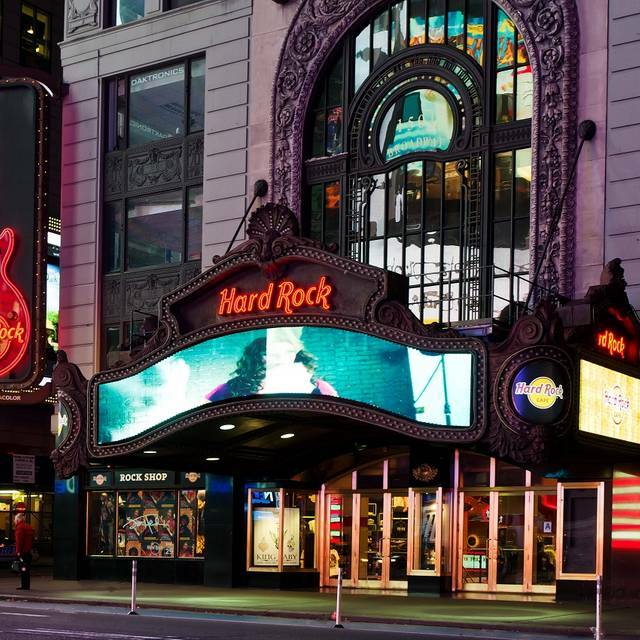 The fun and excitement never stops in NYC and Times Square, and it never stops at Hard Rock Cafe New York. 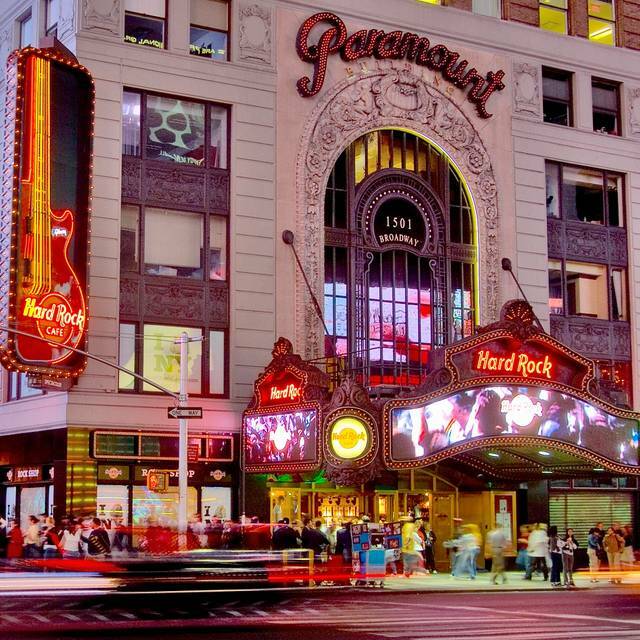 As one of the city's largest entertainment destinations, Hard Rock Cafe New York boasts a unique outdoor space above the building's historic marquee, where guests can host private parties amid the lights and excitement of Times Square. 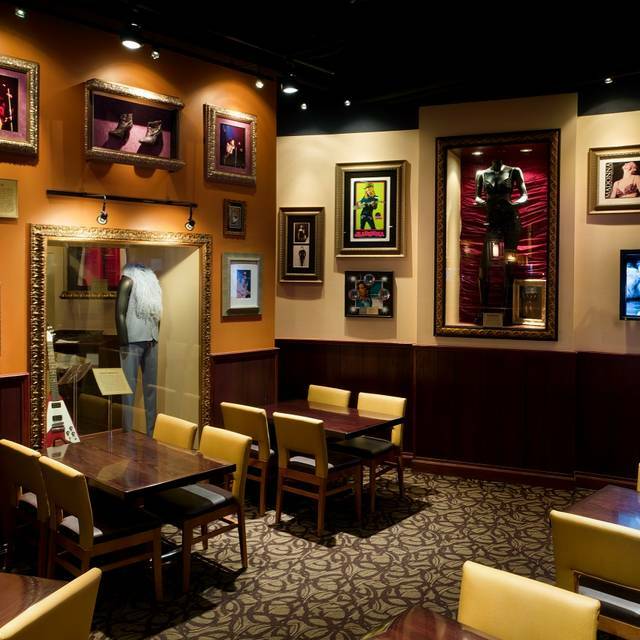 Priceless pieces from legends like The Beatles, Bruce Springsteen, Jimi Hendrix, Led Zeppelin, Nirvana, The Ramones, Billy Joel, and Elvis Presley grace our cafe walls. Bring your Amigos and celebrate with our Tropical Margarita and Rockin’ Fresh Margarita along with our limited time Tequila & Lime Infused Fajitas starting Wednesday, May 1. OPEN for EASTER all day and night. Join us for Breakfast with the Bunny from 8AM-10AM featuring our $19 Breakfast Buffet complete with a Complimentary Mimosa. Not the experience you get in other HRC’s. Was ‘ok’ but wouldn’t rush back. The Hard Rock is very busy and loud. Good to bring families too. Open Table reservations were important to have to get in quickly. We were served promptly. I was surprised with the limited menu options however, and the food wasn't as sufficient in portions as I've remembered from other Hard Rocks. I think the waiter was a little disappointed I didn't buy the drink with the Hard Rock Café glass. We were seated well enough, the ambiance was good, and certainly the company was great. However, there were four of us. We ordered three burgers and a pulled pork sandwich. The burgers all came out together and we were told the pulled pork would be out shortly. It was easily another 20 mins. The burgers were all but finished by the time the pulled pork arrived. Two of the burgers were supposed to have bbq sauce on them. They didn’t. We were then told that the sauce was mixed in with the beef. But there was no bbq flavor to the burgers at all. The third burger was cold. Not raw. Cold. As if it had been cooked and left to sit. Management was lovely. Server was friendly enough. They removed the pulled pork from the bill and gave us free dessert. And while I appreciate the effort, it shouldn’t have gotten to that point. The server mentioned two events going on, and how when that happens, everything else gets kind of crazy. Well if they know that, they should staff for that. Or if the kitchen isn’t big enough to staff for events and general dining, don’t do the events. My party and I had a lovely meal at Hard Rock in NY this Tuesday evening. It was our last night in NY and was made even more lovelier by our waiter Luis. What a fantastic guy,very friendly,helpful and great to talk to person. He was funny too and my nieces wanted to take him home 😀 Thank you Luis for making our last evening an memorable one! We had booked a table for 7:15 pm, but arrived at 6:30 pm, and were told that they were busy, but perhaps we could have a table a little before time if we waited. 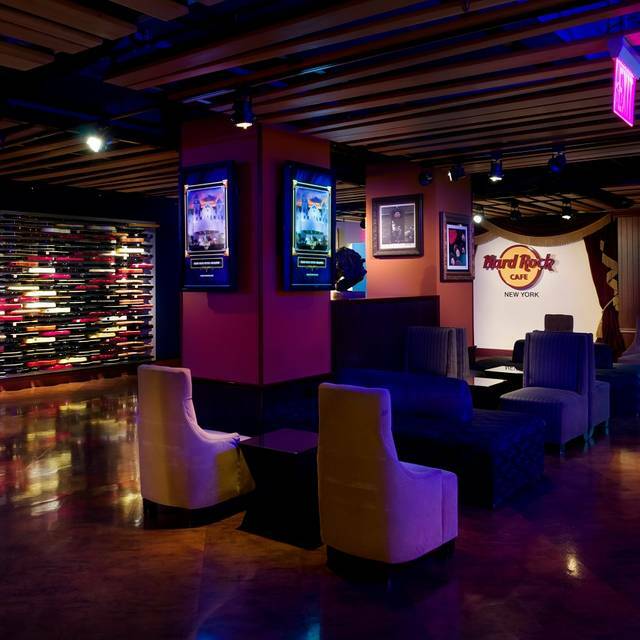 We shopped in the Hard Rock boutique while waiting, and about 10 minutters before time, our “thing” that we were given, bipped, to tell us there was a table for us. We went in to the restaurant, our picture was taken, and we were told to wait for a table. A very rude person at the entrance told us, that it was a mistanke, and we could go back to the shop, there would be no table for us at that time. I noticed a whole lot of empty tablets in the restaurant, and after having watched a lot of people getting a table before us, I asked the person at the entrance how long he would expect us to wait. He got very angry called at the Manager, shouted at us, and we were about to leave, not wanting to have diner there, the Manager came over to us, apologized, and found a nice table for us. Still the start was not god, and that ruins an atmosphere. Inside was very big, with 20 empty tables for at least another half hour. All of a sudden all tables were filled at once. I think Hard Rock let people wait for half and hour or more and then send them in to the restaurant in a Big flok. Not a nice and cosy atmosphere. Even though the staff in the restaurant were attentive and nice, we did not feel for much more than just dinner. After having been there an hour, I asked for a coffee, got it - along with the bill - without having asked for it, they were keen to get the table ready for someone new, as a lot of other tables around the restaurant were getting empty to. We spend a lot of money in no time, and did not have a were good experience, we did not feel welcome. The Food was god, and apart from the person at the entrance, the staff was freindly. It seems more like a money Factory than a restaurant. My son and I came for dinner in between Harry Potter and the Cursed Child shows. We had reservations and were seated exactly on time. Our waiter was attentive and friendly and the service was very good. Our food was very good as well. We will definitely be visiting again. Kathy M.
Excellent atmosphere, good service & food...! We had an amazing experience! When customers pay with credit card, they must see what´s happen. They must put de code number in front of them to avoid the "clonage" of the credit cards. It's a serious matter of security!!! We had a fun meal here and would return. It is crazy on a Saturday evening so do yourself a favor and make a reservation. The wait without a reservation was almost 2 hours, but with our reservation we waited about 10 minutes. People were sitting all around the floor waiting for a table. The place is like a rock and roll museum and we enjoyed all the items on display. The music videos playing were great. I did not like being solicited for a souvenir photo (costs money) so I could have done without that. Our server was wonderful. The food was ok, not spectacular, not bad. But overall we enjoyed it. This was a very unpleasant experience from start to finish. The nachos were burnt and the hamburger was raw. The manager was extremely rude and did not want to help us in any way what so ever. I will never go back there again. We were there to celebrate son 10th birthday. Server seemed bothered by that. Other table around us had much more energetic servers. We got the sour grape of bunch. Overall the restaurant was great and we would go back and hope for better service. One of our favourite places to eat in Times Square. Thanks to Nicole for her good mood. Thanks to the shop guys for their help. Starters Need to be finished and cleared by staff first before you serve main courses as it puts people off still eating staters and main meals arrive. Nice, Fun place for the Children. Menu has a decent range of choices. Horrible! Food was the worst I’ve ever had. The burger was burnt. The only good thing was the service! Just perfect: very smooth reservation process, excellent burger served within few mins, amazing location and environment, reasonably priced. Should I be again in NYC, I'll definitely visit again. Fantastic food delivered with fantastic service. We had reservations and we were treated as if we didn’t. They had us wait until a table was available-25 mins. Keep on going this way. Will always come back. We really enjoyed our visit. The atmosphere was great. Great service and yummy food after busy day! Everything was good. Not over the top or amazing but good. Excellent first visit. Top service. Would visit again but then we like busy bustling noisy places! Loved it! We made reservations for 6:15. After a long day at Beautycon it was so wonderful to be seated literally within three minutes after arriving at 6:15! Loved it! The food was delish and we had great service! It was a nice ending to a long day!